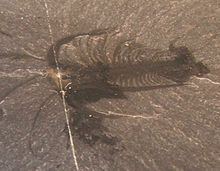 This Marrella specimen shows how clear and detailed the fossils are from the Burgess Shale lagerstätte. Dickinsonia, an Ediacaran animal with a quilted appearance. A fossilized trilobite. This specimen of Olenoides serratus, from the Burgess shale, preserves 'soft parts' – the antennae and legs. 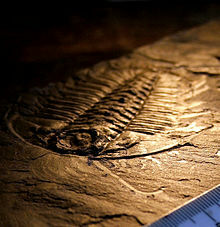 The Cambrian is the first geological period of the Palaeozoic era. It lasted from 541 million years ago to 485.4 million years ago. Before it came the Ediacaran, and after it the Ordovician. Biologists have learnt quite a lot about the soft parts of Cambrian animals. This is because places have been found where soft parts of organisms are preserved as well as their more resistant shells. This means our understanding of the Cambrian biota is better than that of some later periods. Life on Earth changed greatly during the Cambrian period. Before the Cambrian, life was mostly small and simple. Complex organisms (metazoa) evolved during the Proterozoic era. But during the Cambrian period, some organisms used carbonate minerals for shells, so they had hard parts which could become fossils. There were many different kinds of life during the Cambrian period. This increase in the diversity of lifeforms was relatively rapid, and is called the Cambrian explosion. This adaptive radiation produced the first members of the main groups of animals, called phyla. Almost all of this new life was in the oceans. There was little life on land except a layer of microbes. There were shallow seas near several continents, because a supercontinent called Pannotia had broken into smaller pieces. The seas were warm, and there was no ice at the North and South Pole. Many animals with hard shells appeared for the first time during the beginning of the Cambrian. 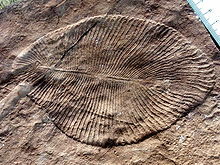 At the start of the Cambrian, the earlier animals (the Ediacaran biota) may have become extinct. It seems these older life forms were affected by new types which burrowed into the sea floor. This changed the conditions of life for the older types. The burrowing must have disturbed the mat of bacteria and algae which covered the sea-floor. About this time we find the first examples of many phyla. There are also some fossil traces on what was land at the time, so perhaps a few Cambrian organisms did leave the water. This is how the sea floor changed during the Cambrian period. First Cnidaria, and probable annelids, about 580 million years ago, in the Ediacaran period. Small shelly fossils (SSF), including first molluscs and brachiopods, about 537 million years ago. First trilobites, about 526 million years ago. First echinoderms, about 522 million years ago. First crustaceans, about 510 million years ago. It is not always clear which phylum a fossil should be put into. So there are some fossils which are still being discussed, years after they were discovered. ↑ They may have continued in places where the sea-floor had not been so disturbed: see Fezouata Formation. ↑ Butterfield N.J. 2001. The Ecology of the Cambrian radiation. Columbia University Press, New York. ↑ Bengtson, S. (2004). Early skeletal fossils. In Lipps, J.H., and Waggoner, B.M.. "Neoproterozoic--Cambrian biological revolutions" (PDF). Palentological Society Papers 10: 67–78. http://www.cosmonova.org/download/18.4e32c81078a8d9249800021554/Bengtson2004ESF.pdf. Retrieved 2008-07-18. This page was last changed on 21 September 2018, at 09:48.